Brockhampton, 1999, Hardback in Dust Wrapper. Condition: Very Good — in Very Good Dust Wrapper. Slight bow to the boards otherwise a very well presented copy. First in this edition. [First: Arms & Armour, 1993] Illustrated with black and white photographs. From the cover: “Some of the most hard-fought naval actions of World War Two took place in the most northerly waters of the world — the Arctic Ocean. Ships progressively covered in ice, their crews steadfast in the bitter cold, battled through heavy seas, all the while under threat of attack from German submarines, aircraft and surface ships, as they braved the route from Britain to northern Russia. The PQ/QP convoys began in late September 1941 and continued throughout the war. Despite pre-war ambivalence between Britain and Russia, the danger of the common enemy in Germany clearly dictated that all aid possible be provided — but the greatest challenge was yet again that of limited Allied naval resources being over-committed. German forces were initially slow to react to the vulnerability of the regular, heavily laden convoys but quickly concentrated aircraft, submarines, destroyers and heavy ships in Norwegian bases. It was there, in her northern fiord lair, that Bismarck’s powerful sister-ship Tirpitz waited for the opportunity to intercept and prey upon the slow-moving convoys. Thus Britain was forced to retain large capital ship superiority close at hand to counter the threat of a heavy strike by these Kriegsmarine units. Weather conditions made service on the PQ routes a constant battle to survive against the bitter wind, hard packed ice and sub-zero temperatures. Nevertheless, the supplies kept going through. And the cost to the Allies was high. For supplying the Russians with close on £500,000,000 worth of vital weapons, transport and ammunition, 18 warships and 104 merchant vessels were sunk. The materiel losses resulting from the debacle of Convoy PQ17 alone were the equivalent of a major land battle. The Arctic convoys still exert a special fascination for the historian, and the exciting nature of the actions is well delivered in this new study by a popular naval writer. 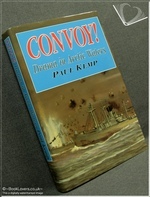 Paul Kemp sets the scene for the history of the convoys before a lively narrative covering their entire history. Highlights include a full section on PQ17 alone and a stirring account of the Battle of the North Cape. Size: 9½" x 6¼". Pictorial boards. 256 pages.